The other day I had the idea to create a separate blog for the Gene Stratton-Porter site as a way to share what was blooming. So this morning GSP Outdoors launched. What do you think? Should I continue it? 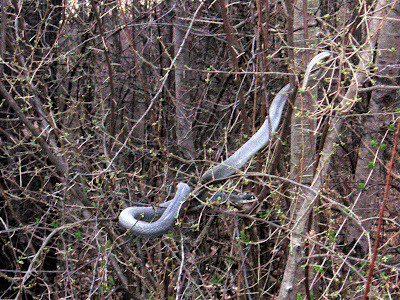 Blue racers are rarely found in shrubs or trees, but this rather large one climbed the undergrowth on the edge of the woods. They climb when threatened. I wonder if Samson, our yellow lab, didn't scare the snake into the branches. Note the buds on the shrubs! Across from the Gene Stratton-Porter State Historical site, where I'm restoring the gardens, is a 100-acre island accessible only by boat and surrounded by wetlands. The Nature Conservancy owns one of the wetlands, Swamp Angel, which is closed to all but scientists because of the number and diversity of plants, such as the carnivorous pitcher plant. The island was owned by the Boy Scouts for many years and there are a few remnants of their buildings. Men visiting the site will often reminisce about their time on the island. The Boy Scouts sold the island to a developer who has been trying to build a bridge over the wetlands in order to develop this pristine site. The good news? The lake association purchased the island and will preserve it. I'm not sure of the role of the site in the island's future, but my view from the garden, past the house, across the lake, will continue to be pristine beauty. 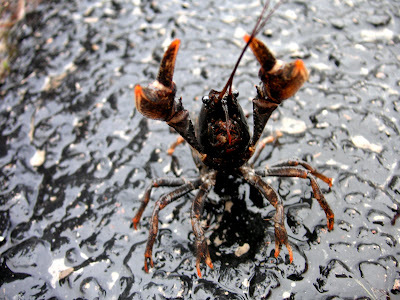 When I walked to my car Friday in the rain, this little guy was scampering across the driveway. When the monster Earth Girl got near, he reared up on his hind legs, but how frightening can a creature be who lives in my Lady's Mantle? 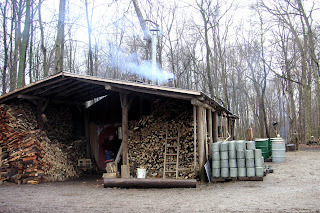 The sap is still flowing but is no longer good for making maple syrup and Sugar Bush is finished for the year. Here are some pictures from my experience this year. 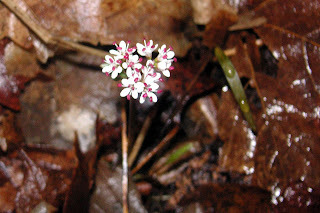 On the last day, the woods were full of Harbingers of Spring, Erigenia bulbosa, also known as Pepper and Salt. Sugar Bush Larry explains to a school group how the sap is boiled down into syrup. Everything is powered with wood, from the evaporator to the steam whistle to the griddles for frying pancakes. Here's Earth Girl showing them how to tap a tree using a brace and bit. One 5th grader told me, "It's like heaven in a tree." We bought the boys a car Monday evening, their grandmother's lavender Taurus. The boys call it purple. Will they be traumatized for life? The next evening, I took Ricky out to practice as he only has his driver's permit and has not had much driving time with the snow and ice. I marveled at how well he did, making corrections before I had a chance to say anything. When we got home, he started to turn the car around and I assumed he was backing it into the WIDE spot designated for it. But no, he started backing across the parking pad. I calmly asked what he was doing and he grinned. He kept backing. I warned him about the Jeep and Vibe. He kept backing. I yelled for him to stop. He GRINNED and kept backing. I screamed for him to stop when he hit the Vibe. He denied hitting the Vibe until I showed him lavender paint on the orange car and orange paint on the lavender car. Later, after he went to bed, I started thinking about it and realized he was just practicing cool teenage boy moves, backing into a tight spot. Unfortunately, his car would not even fit where he was headed. Good judgement is not his strong suit. I went into his room, sat on his bed and shared with him my thoughts about how all teenage boys back into parking spots. He jumped up, gave me a bear hug and said, "You understand, Mom." We decided that backing lessons are next, using the garbage cans and not my new car. 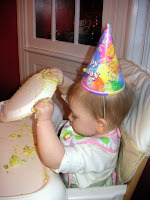 My great-niece, Emily, turned one last Saturday and celebrated by eating cake for the first time. Then she sang and danced with a karaoke microphone. A good time was had by all. Yesterday about 50 second grade students came to the Sugar Bush. After participating in 4 teaching stations and eating a pancake and sausage lunch, we headed into the woods to collect sap. These children were not too experienced in the woods. Despite a strongly worded and illustrated take-home paper on how to dress, only a third of them wore boots. And a mother showed up in WHITE pants. With the snow melt and rains, the ground was muddy. No, that is an understatement. A significant portion of the woods was a sinking, sucking, smooshy mire. Now that can be fun with the proper attire and mindset. I discovered one little boy filling his sap bucket with standing water. I asked what he was doing. He said that sap was mostly water, so he found an easy way to fill his bucket. I can't imagine if he had poured that mess into the collecting tanks that feed the evaporator. Another volunteer heard a little boy screaming for help. He walked over and found him with his arms wrapped as far as possible around a tree, standing on its root bulge in his socks. He walked right out of his sneakers when they stuck in the mud. The volunteer rescued the boy's shoes, which the boy grabbed and ran to the outbuildings as fast as he could. What's blooming in my garden in the middle of March? 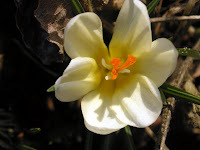 The species crocus in shades of yellow, purple, white, cream (below) and lavender. 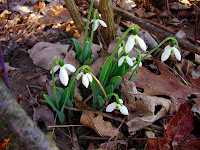 The snowdrops hidden in the fence row. 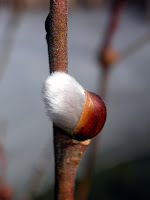 The pussywillows are just emerging. 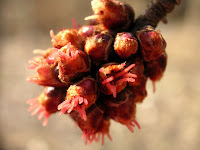 Then I had to search to find other blooms: maple tree, moss, and fungus. 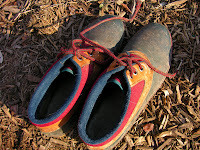 Carol over at May Dreams Gardens issued a garden shoe challenge. It's taken me several days to respond to the challenge because I had to get some of these shoes dirty outside first. I have a lot of "gardening shoes" (these aren't all) because I tend to ruin shoes by walking outside just to admire the garden and then digging in. So here are my shoes and I'm sure The Manolo wouldn't approve. 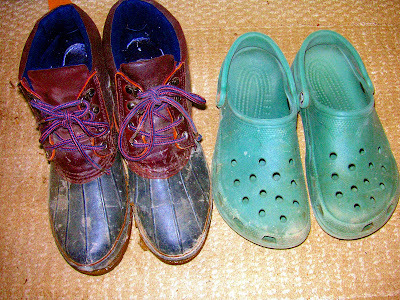 I wore the green and leather boots today when I was cleaning up and I wear the Crocs in the hot summer. I'm constantly kicking soil out of the Crocs and my feet end up filthy. The moccasins are an easy pair of shoes to slip on when I need more support. 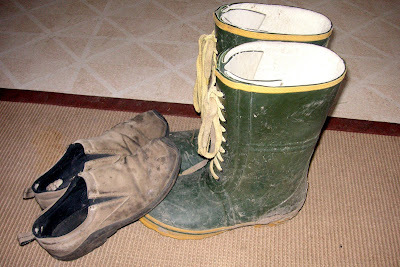 The tall boots helped me collect maple sap last weekend but they usually live in the Garden Shed at the site. These Bass shoes have served me well for about 15 years but finally developed a little leak. They are insulated and are good for early and late gardening. 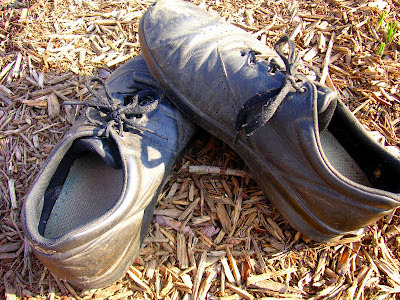 Finally, these Sas shoes have seen many hours in the garden and are my favorite pair when I'm using a shovel. They remind me of Gertrude Jekyll's boots and that's why I love them. How have I spent these first few days of spring weather? Steve and I spent them in a maple woods gathering sap (it's flowing fast and furious now), finding bright red fungus (it looked like plastic) and a very large bird skull (probably an owl). I potted up some caladiums and begonias I overwintered, but am getting a very late start on seeds. I checked the ground to see if I could start planting some early crops, but it is still frozen solid. The snow melt revealed a lot of our dog's treasures in the yard, which are now in the garbage. We went to the Boys' Club Saturday night on the river and trudged down to stare at the water. It is flowing in the center but there are still sheets of ice along the banks. I had great fun in breaking off big sheets of ice with a long stick and sending them into the current to watch where they crashed. After watching a few minutes, Steve said, "I've got to find a stick!" Ricky grabbed my hand and pulled me outside yesterday to show me the almost blooming crocus. What a thrill that some of my joy about gardening has rubbed off on my sons. It is finally reaching the 50s today. The birds are singing and the sun is shining. After book club this morning, I'm going to check the woods to see what's up. I suspect I will only see the garlic mustard and will plan my spring attack against this invasive weed. I'm curious to see how much progress I've made over the past five years. With the sun shining in my east windows, I may also break out the window cleaning supplies so I can see out. How did they get so dirty since Christmas? UPDATE: Just came in from the woods, the snow covered woods. 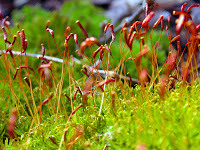 So even with 50 degree temps today, I'll have to wait a few more days before I can survey the woodland wonders. The birds are still out in full force though. Do I really have to move to Plan B, window washing? Today I received a treasure in the mail. My Uncle Sandy (for Sandford) sent me this photo of his parents and sisters along with this characteristic humorous note: "A while back I promised you a family picture. I guess Joan to be four years old putting the picture about 1930, probably in a studio in Warsaw. Since I wasn't born yet, the details are a little vague." Uncle Sandy is the only surviving sibling. My mother is the middle girl in the back. If you knew her, you would recognize her instantly. Judging from my grandmother's hairstyle and dress, I think 1930 is about accurate. My grandmother and Aunt Mary (the first girl in the back row) were both freckled red-heads, but Mom and Aunt Joan (last girl in the back) had their father's coloring. 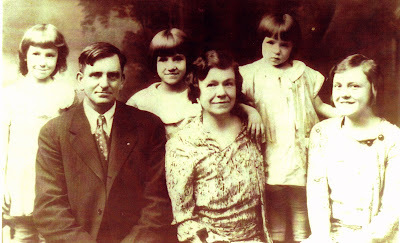 Aunt Marjory, in the front row, was their half sister. The presentation went just fine and no one asked about my raccoon eyes. There was a nice turnout, despite the fact that the "room" was the curtained-off end of a cold dark hallway half a mile (not really) from the show. Oh, and they replaced the projector so the colors were true on the slides. It was fun to meet Kylee and her Mom, although I didn't have much time to talk. She has a nice post about the show on her blog. While I walked around for several hours after the talk, I wasn't engaged. Too much adrenaline. I did buy several packets of seeds, dahlia bulbs and liliums for the site from the Master Gardener booth. My niece brought her two youngest, Caleb and Morgan. Caleb slept through the talk, but Morgan was engaged. It's interesting what a kindergartner absorbs. She really honed in on the fact that Gene Stratton-Porter died in a car accident. She asked me about it after the talk and then she reported to her grandmom (my sister), "That woman died in a car accident." Her other grandmother recently had a car accident, which was probably why it made such an impact on her. My niece, bless her heart, asked if it was possible to volunteer in the garden. I didn't even plant that question! And several people I worked with years ago saw my name and decided to attend. They said they were going to show up for the volunteer work day on April 21. Yippee! One of my goals is to develop an active volunteer program at the site. I went with Renee and we had a nice lunch at Panera's before the show and made plans to take several short garden trips this spring. Any suggestions for day trips? My list includes the Chicago Botanic Gardens and T.C. Steele garden in Brown County. This has been an interesting process, since it started when I asked if she wanted to go on a 2-week trip to England with Purdue Master Gardening staff. Then we decided to cut the cost and time with a trip to Butchart Gardens in Vancouver with Elderhostel. Now we are talking about a series of day trips. The school groups have descended, from kindergarten to 5th graders. The sap will be running heavy today since the days are warmer. Someone asked in the comments about the taste of sap. Since there is a 40 to 1 water to sugar ratio in sap, it tastes like very weak maple syrup, or more like barely sweet water. I observed the tapping last Thursday and the guy who was leading the group started to tap an oak tree until the owner of the camp spotted him from across the camp and ran to him yelling, "Stop! Stop!" I taught classes on Friday and Monday without incident. Except I ran into a tree branch and scratched my eye. I am speaking tomorrow at the Home and Garden Show and my eye is still swollen and red. I don't think makeup will help. My plan is to dazzle them with my smile and bold hand gestures so they don't notice my eyes. You know, kind of like a magician. My computer gave up the ghost this week. It should be repaired by tomorrow, but tomorrow's presentation isn't complete plus I needed Internet access to complete a freelance job. I was able to get the boys' computer hooked to the Internet with only one call to the cable provider, but the printer plug doesn't fit. Nor does it fit the two laptops in the house. I definitely need to print my notes to the presentation, so I might borrow a computer or see if I can print at the library. Another woe: we had access to the projector yesterday to test our presentations and the projector distorted the colors. Blues are purple and browns/oranges are yellow. The AV team tried to convince me it was OK but when showing pictures of plants, it doesn't work. I'll find out tomorrow if it is corrected. Otherwise, I need to allot an additional ten minutes for saying, "This is really blue/white/yellow/orange." I also have to cut some more time from the presentation or else there will be no Q&A time. Last night I put a deep slice in the end of my thumb with the chef's knife. The coffeepot stopped working. I never made it clothes shopping so I'm not sure what I'm wearing. Oh, a couple posts ago, I wrote about how I was going to count my blessings. Let me think. I was able to work around most of the issues so far. The pears I canned are delicious. I like my new car. School hasn't been cancelled this week. I'm almost finished with Team of Rivals for book club next week and it is fascinating but long. Hubby has great stories every day from student teaching, which I can't share. Except this one: He was grading a test last night and one 5th grader wrote about the mid-evil period. You know, Europe between the 5th and 16th century. Right after the early-evil period and before the late-evil period.